This is a general type chuck with the chucking portion centered, and with the stopper face aligned to edge face. This type of chuck securely clamps even black-skin cast/forged parts with draft (up to 20°) to ensure consistent dimensional accuracy in the axial direction even during heavy-duty cutting. Two-jaw or three-jaw structure is available. The chuck can be easily changed for either OD (outer diameter) or ID (inner diameter) chucking. Jaws, stoppers and other upper parts are designed according to customer’s individual needs. 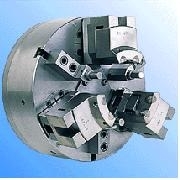 Also, a wide variety of jaws are selectable for various kinds of workpieces. The carbide-insert jaw and special-shape jaw are effective for machining difficult-to-cut materials. The high-tensile aluminum jaw is suitable for high-speed machining. The pair-type jaw and Quick Jaw are useful for large-variety parts machining.